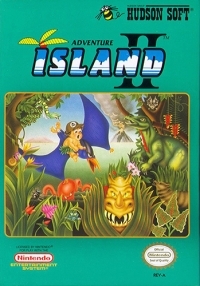 Box Text: Soar into actio nwith ADVENTURE ISLAND II. That Evil Witch Doctor's just snatched your favorite lady. And you've got to battle your way past EIGHT treacherous islands to get her back! Combat prehistoric monsters -- some of the creepiest, fire spitting critters ever to slither across a video screen! Survive molten volcanoes. Dodge giant scorpions and king cobras. And the action gets even crazier with a new vertical/horizontal scroll. While stage select lets you control play. 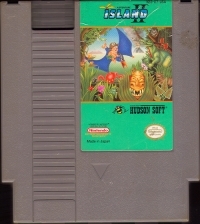 So sharpen your axe, slip on a leopard skin, and take off for ADVENTURE ISLAND II. It's gonna be a wild ride!!! 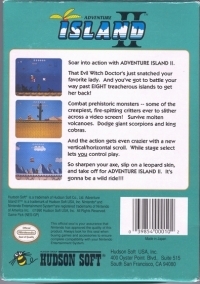 11-16-2012 exonerator Box Text Soar into actio nwith ADVENTURE ISLAND II. That Evil Witch Doctor's just snatched your favorite lady. And you've got to battle your way past EIGHT treacherous islands to get her back! Combat prehistoric monsters -- some of the creepiest, fire spitting critters ever to slither across a video screen! Survive molten volcanoes. Dodge giant scorpions and king cobras. And the action gets even crazier with a new vertical/horizontal scroll. While stage select lets you control play. So sharpen your axe, slip on a leopard skin, and take off for ADVENTURE ISLAND II. It's gonna be a wild ride!!! 11-16-2012 exonerator Alt-Name é«˜æ©‹åäººã®å†’é™ºå³¶â…¡, Takahashi Meijin no BÅken Jima TsÅ«, lit. "Great Takahashi's Adventure Island II"
This is a list of VGCollect users who have Adventure Island II in their Collection. This is a list of VGCollect users who have Adventure Island II in their Sell List. This is a list of VGCollect users who have Adventure Island II in their Wish List.